We’d love your help. Let us know what’s wrong with this preview of Plot Versus Character by Jeff Gerke. What's more important to a story: a gripping plot or compelling characters? Literary-minded novelists argue in favor of character-based novels while commercial novelists argue in favor of plot-based stories, but the truth of the matter is this: The best fiction is rich in both. To ask other readers questions about Plot Versus Character, please sign up. I was very interested to get a chance to read Plot Vs Character after enjoying 50 first pages (a later product from Gerke) It is with some irony that PVC starts awkward and repetitive, I didn't count how many times Gerke tried to convince be that EITHER YOU ARE PLOT OR CHARACTER DRIVEN but if he used one more metaphor, I may have been paying my brovis for a new book. Luckily after the intro the book improves. G does do a good job stitching the ideas of character and plot to a coherent whole. The I was very interested to get a chance to read Plot Vs Character after enjoying 50 first pages (a later product from Gerke) It is with some irony that PVC starts awkward and repetitive, I didn't count how many times Gerke tried to convince be that EITHER YOU ARE PLOT OR CHARACTER DRIVEN but if he used one more metaphor, I may have been paying my brovis for a new book. 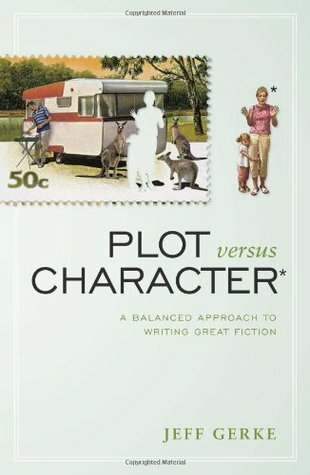 Plot vs Character by Gerke is a handy book for both the plot-first author and the character-first author. The book is meaty and thought-provoking, guiding writers through developing both the character and the plot of your story. Gerke teaches at conferences around the U.S. and years ago, he helped me in my own writing, specifically learning the "three act structure," which he covers in-depth in this book as well. This is a very well-rounded book to help any author at any stage cement the foundat Plot vs Character by Gerke is a handy book for both the plot-first author and the character-first author. The book is meaty and thought-provoking, guiding writers through developing both the character and the plot of your story. Gerke teaches at conferences around the U.S. and years ago, he helped me in my own writing, specifically learning the "three act structure," which he covers in-depth in this book as well. This is a very well-rounded book to help any author at any stage cement the foundation of their stories and characters. I love the way Jeff Gerke writes. It feels like I'm having a conversation with him. It's also great the way he provides a lot of examples from books and movies to illustrate his points. I think I am more of a panster than a plotter, but this gave me insight on what it takes to have a great story filled with amazing characters. It's a terrific reference and I will probably come back to it often. This book is a must-read for novelists. Whether your strength is characterization or plot, this book will help you manage your weakness by developing the other. I re-read the second half of this book (plot) every time I start a new book, because plotting is my weakness. I always come away with a ton of ideas that will strengthen the story and make it more engaging to readers. I gleaned so much from this book. It's one to keep on the shelf for sure and I know I'll be referencing it as I plunge into my novel writing. Full of examples and opportunities for brainstorming. Highly recommend to anyone wanting to write a novel. It had some good points, but rambled on so badly. Very difficult to read. I picked it up to help me develop better plots for my fiction books, but I can't say it really helped. A different kind of book, though. Unique. This is a case where, the writing is simple to the point of basic, and the author, or author’s voice, truly annoys me, but there is still some wonderfully valuable information. Primarily, that both matter, and a novel that neglects one of these areas will really suffer. Just understand that you’ll have to sift through gems like, “Humans are Religious” and “Get Wacky!” Yes, with an exclamation point. Indeed. The greatest value for me, was how he learned to transform his boring, flatly written characters, into believable people. As an introvert, I feel like I need some major insights into human behavior, and was relieved to come across this information. The author discusses a psychology book, Please Understand Me ll, by David Keirsey. This book uses Myers-Briggs personality profiles / temperament classifications (of which there are 16) to establish a base layer, and then recommends layering more specific and topical traits upon this core. Interesting. Specific, reality-based, and actionable. This provides a solid foundation, and removes a bit of anxiety. The author references 2 other books, 45 Master Characters, by Victoria Schmidt, and The Writer’s Guide to Character Traits by Linda Edelstein, PhD. Next, there is a misguided chapter on writing confusing dialogue. I understand where he’s going —don’t be literal— but he way overshoots. Then, some advice about how your protagonist should both be likeable, and have a problem to solve. Which brings us to the part of the book, where I stopped reading the book. 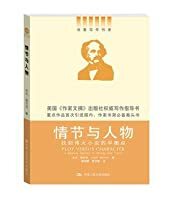 Plot versus character is a very interesting and useful work for a novelist who is just beginning. It is less useful for established authors, however, it is valuable to consider the role of character and plot as they interact. The author has an interesting style that is part conversational and part a irreverent. This is a quick read and there isn't too much filler. This book kept getting recommended to me so I bought it and read it. I followed the exercises for a new project and I definitely like the results. I hope I get the opportunity to take the author's class in person, but in th meantime the book introduces the complete system. A lot to chew on here. This is a fairly well-written book about how to write fiction. The author, Jeff Gerke, provides good advice about two different areas -- how to create good characters, and how to create a good plot. Gerke begins by positing, and I would say I agree, that all writers fall into one of two basic types: plot-based or character-based. For plot-based writers, the external events of the story (i.e., the plot) come easily, but crafting good characters is difficult. For character-based writers, making re This is a fairly well-written book about how to write fiction. The author, Jeff Gerke, provides good advice about two different areas -- how to create good characters, and how to create a good plot. Gerke begins by positing, and I would say I agree, that all writers fall into one of two basic types: plot-based or character-based. For plot-based writers, the external events of the story (i.e., the plot) come easily, but crafting good characters is difficult. For character-based writers, making realistic, believable characters with interesting inner journeys is easy, but building an external plot to entertain the reader is difficult. Gerke, who admits he is a plot-based novelist, then provides a very good explanation of how to include both in your writing -- good, believable characters who undergo an inner journey, and an interesting and exciting plot that keeps the reader turning pages. He explains all the basic concepts that one would encounter in a typical writing class or book about writing. But what sets this book apart from all others I have read, except perhaps Save the Cat! by Blake Snyder, of whose writing Gerke strongly reminds me, is that Greke provides the budding writer with a set of methods to actually accomplish the goals he sets out. For example, he doesn't just tell you "your character needs to be realistic;" he provides you with a whole chapter on how to make the character be realistic. He doesn't just tell you that Act I is "where all the important stuff is introduced," but he provides you with a list of items you should consult to make sure your Act I is doing what it is supposed to do. In each chapter, he suggests exercises the reader can do to develop the novel. If you follow each exercise, by the end, you will have a well-plotted novel with a set of interesting characters and a protagonist whose inner journey meshes well with the external plot. As a consequence, this book is one of the few I have encountered about writing (with Save the Cat! being the other) that actually gives the budding novelist actionable advice. I have not yet tried Gerke's system (I have read this book over a holiday without any real ability to start writing a novel or keep notes or doing extensive research), but I plan to put it into action in the near future, and I have no doubt it will help -- because it already has. In many ways, Gerke's system reminds me of Snyder's from Save the Cat!, as I have said above. The main difference is that Snyder's book is almost entirely focused on how to achieve the plot -- the external journey of the character. He mentions the inner journey and addresses it in a chapter or two, but he does not spend anywhere near the number of pages on how to build a good one and flesh it out that Gerke does. Snyder's process is also a good deal more formulaic. For example, Gerke takes a dim view of telling people that Act I should be over on a certain page, whereas Snyder clearly tells the reader on which page each event should happen (to be fair, Snyder is explaining how to write a 110-page standard-length movie script, and Gerke is talking about writing an open-ended novel). But overall, their advice is remarkably similar. Interestingly, at least half of Gerke's examples come from movies rather than novels. I suppose in part, he does this because he can be more sure people have seen Star Wars or Titanic (since almost everyone has) than he can be that they have read Lord of the Flies. I don't have an issue with this, although some readers might be bothered by it. But perhaps my favorite bit of advice that Gerke provides, which I have seen nowhere else and which, in fact, many other advice books (including Save the Cat!) contradict, is that one should not worry about the length of each act in a 3-act structure. It's OK, he says, if it takes half of the book to get through Act I. As I began to think about other stories I have loved, I noticed that a few of them have very long first acts as well. Thus Gerke states explicitly what I have always intuited, and it is something that has bothered me about the advice of other books on 3-act structure. Overall, this is one of the most helpful books on writing I have encountered so far (and I've read at least 10 of them, if not more). One a very basic level, Gerke doesn't say anything you probably haven't heard a thousand times before if you are a budding writer - all characters in a novel should be realistic and not stereotypes; the protagonist needs to change in a major way; there should be a "ticking time bomb" to force the plot forward; the external and internal struggles should be related. But the difference between this book and all the other places where you receive such advice is that Gerke doesn't just tell you that you need it, and perhaps provide examples of other books/movies that have it -- he shows you how you can put those things into your story, and provides you with a series of exercises and assignments designed to help you do it. Gerke begins by identifying novelists as one of two types: character-focused and plot-focused writers. By focusing on one aspect and ignoring the other, however, Plot vs Characterwriters often end up with one of two stories: rich, interesting characters who do nothing, or stereotypical, shallow characters saving the world. Though he encourages readers to know which type of writer they are, Gerke’s book discusses both sides and is mapped out to take a writer through the entire process – from char Gerke begins by identifying novelists as one of two types: character-focused and plot-focused writers. By focusing on one aspect and ignoring the other, however, Plot vs Characterwriters often end up with one of two stories: rich, interesting characters who do nothing, or stereotypical, shallow characters saving the world. Though he encourages readers to know which type of writer they are, Gerke’s book discusses both sides and is mapped out to take a writer through the entire process – from character development to the denouement – in order to create a well-rounded novel. The first section of the book – Memorable Characters – walks you through character development. Gerke starts with Core Personality and Physical Attributes, digs into the character psyche to find The Knot (core issue/struggle), and takes you right to The Final State. It’s more than just knowing whether or not your hero is an introvert. Gerke looks at the complete inner workings of your characters. He shows you the steps to take to find out every little cog that makes them tick. By the time you finish, you’ll know your characters better than you know your spouse. The second section – Marvelous Plots – looks at the external components of the story: the plot. Using a traditional Three Act layout, Gerke takes the information from section one and shows you how to weave your Memorable Characters into the Marvelous Plots. He shows, using numerous examples from books and movies, how characters and plot work together, complimenting each other to tell a captivating story. I’ve always been a proponent of continuing professional development, regardless of whether I was a computer programmer, a corporate director, or now, a writer. And, of course, I love books. So I look for books that helps me develop my skills. That’s what I found in Jeff Gerke’s Plot versus Character. I’ve taught both Characterization and Plot at writing conferences, so I don’t consider myself a novice when it comes to either, but I learned some new techniques for both. Gerke begins with an illus I’ve always been a proponent of continuing professional development, regardless of whether I was a computer programmer, a corporate director, or now, a writer. And, of course, I love books. So I look for books that helps me develop my skills. That’s what I found in Jeff Gerke’s Plot versus Character. I’ve taught both Characterization and Plot at writing conferences, so I don’t consider myself a novice when it comes to either, but I learned some new techniques for both. Gerke begins with an illustration that rang true with me. When Irving Berlin wrote his first song, Alexander’s Ragtime Band, it consisted only of music. No words. And it didn’t strike a chord (pun intended!) with the public. It wasn’t until he added words that the song became a hit. That illustrates Gerke’s point in writing the book – writers can’t focus only on character, or only on plot. It takes both, working hand-in-hand, to create something that will reach readers. I love approaching characterization by determining a character’s Meyers-Briggs temperament, and then ensuring that every aspect of that character stays true to that temperament. (I’ve been a Meyers-Briggs fan from way back in my early corporate days – I’m an ENFP.) And I gained some new insights about creating a page-turning plot, too. If you’re interested in writing fiction, this book will stretch your skills and help you improve your craft. Jeff Gerke's book Plot Versus Character is a no-nonsense guide to help writers recognize where their strength lies and implement tools with which to balance both plot and character development. If your strong suit is creating characters and you want to gain an edge in your plot writing, Gerke offers clear-cut exercises on how to do so. If you already know how to write gripping plots, but are weak in character development, this book will show you how to seed elements into your characters' makeup s Jeff Gerke's book Plot Versus Character is a no-nonsense guide to help writers recognize where their strength lies and implement tools with which to balance both plot and character development. If your strong suit is creating characters and you want to gain an edge in your plot writing, Gerke offers clear-cut exercises on how to do so. If you already know how to write gripping plots, but are weak in character development, this book will show you how to seed elements into your characters' makeup so that plot and character intertwine seamlessly. You'll soon find both plot and character popping from the page. Either way, whether you think you are strong in plot or character development, you'll find all new lenses with which to analyze your writing, and you'll find a whole new level of expertise just waiting for you to unlock. this is the most helpful book that I think I have ever read about writing fiction. It isn't enough to say that you need well written characters if you never tell how to write characters well. In this book Jeff Gerke does. Plot versus Character contains two parts. Part one is all about Character creation. I loved this part because I write people very poorly. In this part Gerke takes the character down to a core personality and explains how to add layers until a fleshed out person emerges. Part two this is the most helpful book that I think I have ever read about writing fiction. It isn't enough to say that you need well written characters if you never tell how to write characters well. Part two focuses on Plot creation and even though I had heard a lot of this information before it was still fascinating because he ties it back into character creation so completely that you realize that character is the plot and the plot is the character. Are you a character-based writer, or a plot-based writer? You can strengthen your weakness and play to your strength with this book. Plot Versus Character takes you through the process of developing your characters, and then developing your plot from your characters. It a very helpful, step-by-step process. One note--characters are developed through the Myers-Briggs' 16 personality types. The author recommends using Please Understand Me II: Temperament, Character, Intelligence, so you might want Are you a character-based writer, or a plot-based writer? You can strengthen your weakness and play to your strength with this book. Plot Versus Character takes you through the process of developing your characters, and then developing your plot from your characters. It a very helpful, step-by-step process. Every once in a while, there’s a book that’s lain unread in my TBR pile which, I discover when I eventually read it, is worth its weight in gold. “Plot versus Character: A Balanced Approach to Writing Great Fiction” by Jeff Gerke is one of those books. With flashes of natural humour, a sound logical approach and clear, easy-to-read language, Gerke teaches writers how to balance great character sketches with page-turning plots. He shows how both plot and character must be integrated to provide the Every once in a while, there’s a book that’s lain unread in my TBR pile which, I discover when I eventually read it, is worth its weight in gold. “Plot versus Character: A Balanced Approach to Writing Great Fiction” by Jeff Gerke is one of those books. With flashes of natural humour, a sound logical approach and clear, easy-to-read language, Gerke teaches writers how to balance great character sketches with page-turning plots. He shows how both plot and character must be integrated to provide the reader with a story that both satisfies and entertains. And he does it all with such enthusiasm that, as a writer, I caught his excitement and found ideas for my new novel emerging out of the mists of my muse. No matter how experienced one is as a writer, or what your writing style is, this book is an essential part of any writer’s library. This book offers a good foundation for writing solid, compelling fiction. The character building methods get the most emphasis and the plot is then developed around that inner journey. There are plenty of pertinent examples woven throughout and the best parts of the novel involve the discussion of three act structure and character arc. The book was helpful and should be useful to authors seeking to improve either their plotting or character building skills. However, in the final analysis, the aut This book offers a good foundation for writing solid, compelling fiction. The character building methods get the most emphasis and the plot is then developed around that inner journey. There are plenty of pertinent examples woven throughout and the best parts of the novel involve the discussion of three act structure and character arc. Is your strength in writing a plot driven novel, or one that’s character driven? Either way, this book affirms our natural strengths while offering a wider consideration of elements to polish what we’re already doing. And for that area in which we want to improve, there are a variety of exercises to help us along the way. “The core of any novel built with Plot versus Character is the main character’s inner journey.” That quote is taken from the plot section, so you can see how easily this author Is your strength in writing a plot driven novel, or one that’s character driven? Either way, this book affirms our natural strengths while offering a wider consideration of elements to polish what we’re already doing. And for that area in which we want to improve, there are a variety of exercises to help us along the way. “The core of any novel built with Plot versus Character is the main character’s inner journey.” That quote is taken from the plot section, so you can see how easily this author intertwines the two major elements. By exploring and strengthening whichever area a writer defines as their own weakness, and also by refreshing the element that is their strength and their favorite, this book can help writers create a more balanced and compelling novel. Character is plot. If your strength as a writer is characterization, you'll find help here in developing your plot. If your strength is plot, you'll find help in developing your characters. Gerke takes you through the process of first developing your characters, and then your plot. By the end of the book, if you done your homework as you gone along, you can have fleshed out your characters and come up with the plot for your novel. Note: Gerke recommends Please Understand Me II: Temperament, Chara Character is plot. If your strength as a writer is characterization, you'll find help here in developing your plot. If your strength is plot, you'll find help in developing your characters. Gerke takes you through the process of first developing your characters, and then your plot. By the end of the book, if you done your homework as you gone along, you can have fleshed out your characters and come up with the plot for your novel. This is a book every writer should have on their shelf. If you struggle developing dimensial characters with a purpose for existing on your page -or- you struggle developing a plot worthy of the internal and external growth of your characters THIS book will guide you through a series of exercises giving you the skills you need to write the next great story. This will be my go-to book before every new project. Jeff Gerke offers examples of current movies and novels to support the ideas outlined in This is a book every writer should have on their shelf. If you struggle developing dimensial characters with a purpose for existing on your page -or- you struggle developing a plot worthy of the internal and external growth of your characters THIS book will guide you through a series of exercises giving you the skills you need to write the next great story. This is a decent reference to kickstart your own writing. The content is well-structured, and gives you actionable steps to creating your own layered characters (though hold the phone if you're sceptical of personality-type psychology, like "Please Understand Me II" by David Keirsey) as well as to craft a basic three-act plot structure. Unfortunately Gerke's plot examples follow a very typical American-Hollywood line, so you may like them if you're trying to develop a mass-market genre-fiction bl This is a decent reference to kickstart your own writing. The content is well-structured, and gives you actionable steps to creating your own layered characters (though hold the phone if you're sceptical of personality-type psychology, like "Please Understand Me II" by David Keirsey) as well as to craft a basic three-act plot structure. Unfortunately Gerke's plot examples follow a very typical American-Hollywood line, so you may like them if you're trying to develop a mass-market genre-fiction blockbuster, but look elsewhere if you seek a guide with the depth and finesse to hone your literary masterpiece. With PLOT VERSUS CHARACTER, A BALANCED APPROACH TO WRITING GREAT FICTION, Jeff Gerke presents an answer to the age-old question of writers: which comes first, character or plot? Whether you love developing complex characters but struggle to find something for them to do, or excel at developing intricate plots, only to find your characters are made of cardboard, you’ll find solutions to your problem in Gerke’s book. Gerke’s entertaining, friendly style, full of concrete examples, will keep you rea With PLOT VERSUS CHARACTER, A BALANCED APPROACH TO WRITING GREAT FICTION, Jeff Gerke presents an answer to the age-old question of writers: which comes first, character or plot? Whether you love developing complex characters but struggle to find something for them to do, or excel at developing intricate plots, only to find your characters are made of cardboard, you’ll find solutions to your problem in Gerke’s book. Gerke’s entertaining, friendly style, full of concrete examples, will keep you reading, finding insights you can apply to your story on every page. Whatever the level of your writing skill, this excellent book will help you take your writing to the next level. Plot versus Character is unlike most books I have read on writing. Most go on to detail the nuts and bolts of writing, but Jeff gets to the heart of the matter: the story. He pinpoints exactly what will make your main character relatable: the inner conflict (or knot as he calls it). Step by step he helps you create that flawed character.